Hurrah! The Commitments is finally here. The much anticipated show from veteran director, Jamie Lloyd, has come roaring into the Palace Theatre! 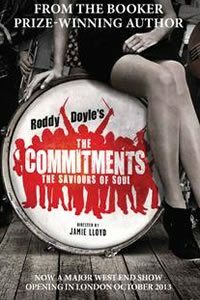 Based on Roddy Doyle’s hit novel and movie, The Commitments, the West End musical of the same name stars a talented cast of soulful singers, and a man with very tight jeans. 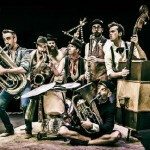 I was lucky enough to catch up with leading actors, Killian Donnelly and Denis Grindel to discuss their roles of Deco and Jimmy in the show. Q: So hello! Here we are with Killian and Denis… I am in an Irishman’s dressing room! It’s not a dream, it is an interview. Ah! How are you today lads? Q: And Killian, don’t think you are going to get away with it either – let’s discuss those superman pants! Q: Are they from your own wardrobe? K: They were actually my suggestion. Luckily with the year the show was set we could actually have superman pants! I was delighted with them! My mam loved them when she saw them! Q: Your mum! I was going to say is this kind of show you can invite your mum to? There is a lot of swearing, nosebleeds, the “C bomb”…is this a mum show? K: Well my mam loved it, she had read the book ages ago. K: It in the first five minutes it becomes the language and you just sort of absorb it really. People are loving it though. Q: Who would you say is the target audience for The Commitments? K: Jamie didn’t want to filter it down or just make it for one specific audience. He wanted it to be it’s own piece and that is what people are enjoying about it. D: I think it’s good too as it is hitting a niche that not that many other musicals are; Men, like older men, want to come and see the show. They can enjoy it without feeling like they had to go! Q: Bellies, superman pants…it is a sexed up show! Has this increased your fan base? D: I never had Twitter before but now I do and now I have a Twitter fan club! There are 50 followers! Join today! Q: Do you have any message for the fans? D: Well I got a beanie hat in the post from a very nice girl named Abbie! I’m hoping I can maximize on this and get as many beanies as possible! Q: Ha! Well if anyone wants to send the boys some new hats, get them to The Palace. D: Please do! I have no time to shop! Q: So in the spirit of your new Twitter account and your growing fan club, this is your West End debut isn’t it! How does it feel? D: It’s crazy! It’s bizarre only a month ago I was just finishing college. I’m still meeting my friends from college and they are starting to do some work as well but we all can’t believe that everything has happened so fast! It’s brilliant and it’s fantastic that my first show is something so close to my heart – it’s Irish! Q: How does it feel acting alongside such theatre greats as Killian? D: Never even heard of him! Haha! I’m joking. Killian’s a lot of help really. K: Yeah! Ha! Do you know what I mean! He completely just absorbed the character. Q: So Killian you have been in Billy Elliot, Phantom of the Opera, Les Miserables film and stage show and now The Commitments. How have you got away with not being type cast as one particular style of character? Q: No! How have you gone from playing an angry northern miner to a lover to now playing the soul sister of the Irish world? K: Well this is more the sort of stuff that I really like to sing! I never trained and I walked into an audition asking questions about the character. Les Miserables was the best training I ever had in my life. It opened my voice up. Q: And did you manage it? I did it in my audition! I fell over but one time I did it! Q: So you two are cheeky Irish Men…A lot of the cast is Irish – was this important to writer Roddy Doyle and director Jamie Lloyd. K: I think Jamie was looking to cast it completely Irish but it was hard to find completely Irish actors. They did auditions at home in Ireland and Padraig [Dooney] came over. D: A lot are Irish and we have some good English cast members too! A lot of us are new are unheard of. Jamie found people who were a bit raw, like in the movie. K: He talks [points to Denis], I sing and talk so I think I have one up on him! D: Thank you! I had two songs, they cut one because I was too good at singing! K: I complained actually, I thought he was singing a bit too much. K: It feels like a rock concert. 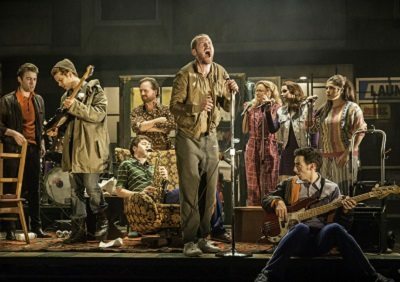 Jamie said” if you could bottle all your faces on stage when the audience stands up at the end, well that’s what it has to be.” That’s what The Commitments feel after their first gig! Q: In the show you all kind of hate each other. Is this true of real life? D & K: Yes! Absolutely! D: He said something really funny in another interview, he said even if we did hate each other we can get it all out on stage! K: We can vent! That helps so much! Everyone says in this business: “Oh we are all one big happy family” but actually we get to scream at each other on stage and call each other every name under the sun. It’s great. One of the actors, he plays Mickah, he gives me this headbutt at one point. It looks brilliant. We’re high fiving when we go backstage! 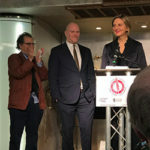 Q: My final question before we move on to the lighting round, which I know you are both very excited about…well it’s more of a role play really. Imagine I am a young lady wandering the street looking to see a show. I’m lost! I really want to see a show tonight, but I don’t really know anything about theatre. I run into you pair – what would you say to me to convince me to pick The Commitments? D: Here love, give me your money! D: [points to Killian] Do you wanna see this guy naked? This fine specimen of a man naked! K: you don’t need to see the show to see me naked! D: But you should come to the show! 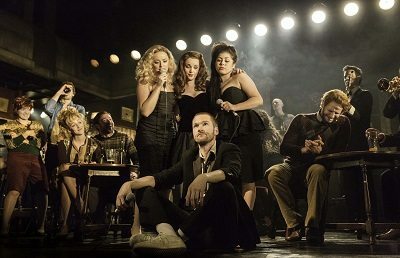 K: If you like a great night out, if you like music and singing along, if you like a good story line and to really enjoy yourself and to laugh your head off by the end of the night, then come and see The Commitments! D: There is violence, swearing, things flying into the audience. K: There are stripping ladies, it’s not just me! Q: Tell me about this good singing? I’m sold! Get me another ticket! Want to know what happens when two cheeky Irish chaps attempt to tackle the lightning round at the same time? Watch below! Killian and Denis were certainly a hoot and a howl! If you want as much fun as I had talking to these guys, then get yourself to the Palace Theatre for a fun packed show!